Responding to a request from statehouse leaders, the Rhode Island Department of Transportation has provided a list of the locations under consideration for placing toll gantries, should Ocean State lawmakers approve a controversial plan proposed last year by Gov. Gov. Gina Raimondo (D) to begin truck-only tolling to fund bridge repairs. In his letter to House Speaker Nicholas Mattiello (D) and Senate President Teresa Paiva Weed (D), RI DOT Director Peter Alviti stressed that the locations are preliminary and subject to change based on the specifics of the final enabling legislation. As the truck-only tolling bill is now written, tolls would be levied on commercial vehicles of Class 8 and higher. 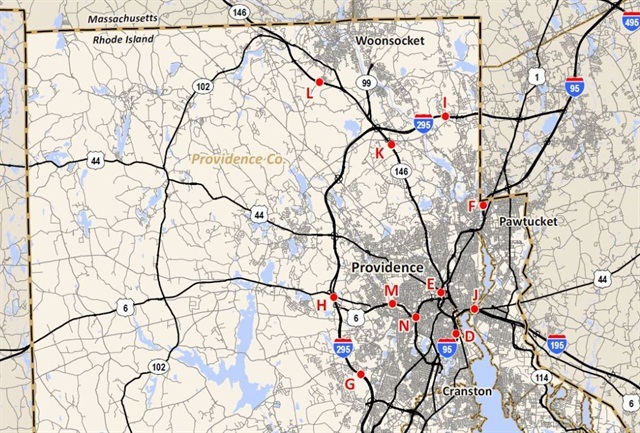 Nearly half of the 14 proposed toll locations are along Interstate 95. There are also 3 on I-295 and one on I-195 as well as 2 on U.S. Route 6 and 2 on RI Route 146.